Volkswagen’s Car-Net technology is a multipurpose system that comes installed on the majority of 2018 and 2019 Volkswagen models. Car-Net’s App-Connect smartphone integration is a major draw, but the available navigation and security bundles should not be ignored. Car-Net Security & Service is the name of Volkswagen’s bundle of cutting-edge safety and emergency service features. Here’s what you need to know about Volkswagen Car-Net Security & Service features and pricing. Read More: How Do I Use the Navigation System in My Volkswagen? 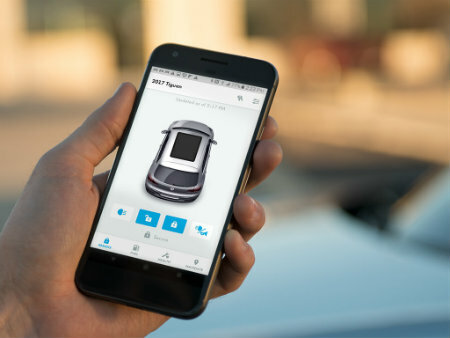 Volkswagen Car-Net Security & Service allows users to locate their last parked location, remotely lock and unlock doors, receive vehicle health diagnostics, help locate a vehicle if stolen and contact emergency services. In the event of a problematic diagnostics report, Car-Net Security & Service allows users to easily schedule a checkup with a local dealer. Features such as Roadside Assistance, Manual Emergency Calling and Automatic Crash Notification allow drivers to contact vehicle specialists and emergency services as needed. Newly-purchased Volkswagen vehicles with Car-Net Security & Service support come with a six-month trial starting the day of purchase. After the trial period, owners have a variety of subscription plans to choose from: Monthly billing at $17.99/month, one year for $199, two years for $378 or three years for $540. For any of the yearly plans, the option is present to switch to the monthly subscription after the yearly plan expires. What Volkswagen models include Car-Net Security & Service? Volkswagen Car-Net Security & Service is available with select trim levels of the following models: Jetta SE with Connectivity and higher, Passat SE and higher, CC Sport and higher, Eos, Beetle SE and higher, Beetle Convertible SE and higher, Golf S and higher, Golf R, e-Golf, Golf SportWagen, Golf Alltrack, GTI, Tiguan R-Line and higher and Atlas. Shopping for a Volkswagen? View our online inventory and find your next vehicle today. This entry was posted on Friday, July 6th, 2018 at 6:22 pm	and is filed under Technology. You can follow any responses to this entry through the RSS 2.0 feed. You can skip to the end and leave a response. Pinging is currently not allowed.